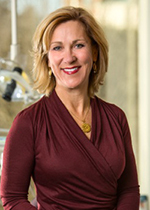 Dr. Cecilia Gyllenhoff has practiced general, cosmetic and restorative dentistry since 1988. She is passionate about her work and strives to give her patients the best smile possible! In 1990, she began to develop the relationship-based style of practice she uses today. She works to establish a caring rapport from the start, getting to know each patient’s individual needs and goals. She focuses on one patient at a time and provides meaningful health-oriented, ethical care over the long term. Partnering with Dr. Cappiello in 2002, her practice has achieved a kindred mindset with a new level of relationship-based, caring dentistry. Continuing professional development allows McLean Dental Care to offer the latest in cutting edge techniques in the industry. Dr. Gyllenhoff is honored that her skill and commitment has been recognized; she was named a Top Dentist in several editions of the Washingtonian and Northern Virginia magazines. In her early days of practice in Old Town Alexandria, she worked with a team of specialists that helped her see the importance of caring about a patient’s overall health needs and lifestyle. She also learned to provide specialized care, treating people with disabled mouths and significantly misaligned teeth. Two of her areas of special expertise are full-mouth reconstruction and treatment of TMJ. She has two children, a daughter at Virginia Tech and a son still at Langley High School. Now that she and her family make their home in McLean, Dr. Gyllenhoff focuses on providing excellent service in the heart of that community, for patients in the immediate McLean/Tysons Corner area, and in adjoining communities, including Great Falls, Bethesda, Falls Church, Vienna, Arlington and the District of Columbia. She aligns herself with organizations that equip general dentists and specialists for treatment that unites state-of-the-art techniques with an understanding of the whole person. She received advanced training at the prestigious Pankey Institute and is an active member of the local chapter of the world-famous Seattle Study Club. She also participates in ongoing education to continually update her skills. As a practicing dentist, she founded and presided for two years over the Tyson’s Dental Study Club. Currently she donates time to various charities, including the Dental Clinic of Northern Virginia. Dr. Gyllenhoff, the daughter of Swedish immigrants, studied for a year in Sweden before graduating from George Washington University with honors. She then attended Georgetown University School of Dentistry, where she received her DDS. At Georgetown, she participated in student government and served as representative to the American Academy of Dental Schools.